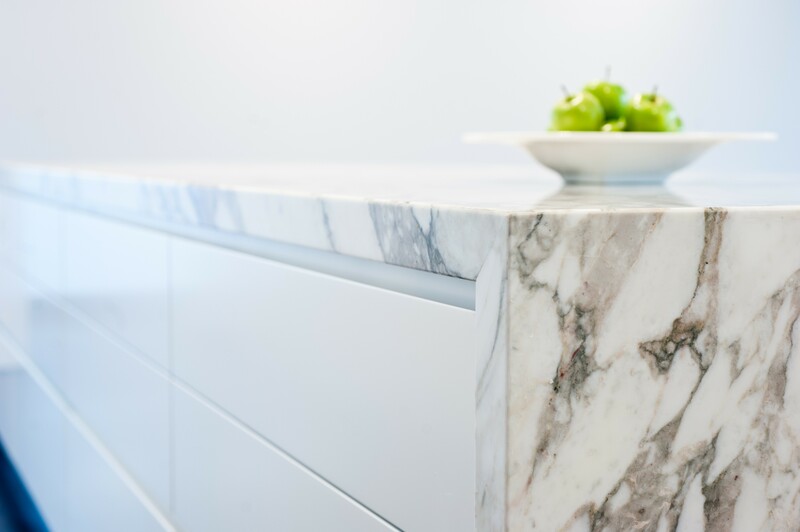 If you’re looking to bring your next home renovation, particularly a kitchen renovation, into the 21st century then perhaps waterfall countertops might be the move to make when selecting your cabinet and counter situation. Unlike traditional countertops, waterfall countertops continue from the edges down to the floor, providing a seamless flow of marble, quartz, or whatever material you opt to go with. While pricey, waterfall style countertops introduce a clean elegance into any space, and often provide a nice common area for guests or family members to share a meal or a conversation. Nevertheless, it’s important to understand some basics when weighing the decision to go with waterfall countertops in your home. And the most important basic out of the gate is to understand it’s not technically a waterfall countertop if the horizontal and vertical sections are not joined by a 45 degree angle. As for the rest of the considerations to take into mind, we’ll begin with assessing your space. The first thing you need to consider is do you have the space to properly install a waterfall countertop? At a minimum you’re going to want the dimensions of the island to be somewhere around 3-ft by 5-ft with counter height and thickness varying based on personal preference and how you plan to use it. You also want to make sure you’re not sacrificing your walking space to add a little bit of class and elegance to your kitchen. After all, stubbing your toe on your waterfall countertop every time you go for a late night snack will certainly make you regret the decision. So it’s vital that you have the necessary space available before you even consider this countertop option. The next element to consider when contemplating your style of countertop is the overall style of the room. While waterfall countertops have grown in popularity over the years, there are some fairly hard rules that apply when implementing them. For instance, if your home has more of a quaint, rustic vibe to it, waterfall countertops will stick out to the point of annoyance while also breaking up the visual flow of the room. However, if you’re going for either a contemporary or transitional look, waterfall countertops are almost necessary. Clean, sleek lines with sharp edges tend to play better with more modern design aesthetics than they do with more old school styles. 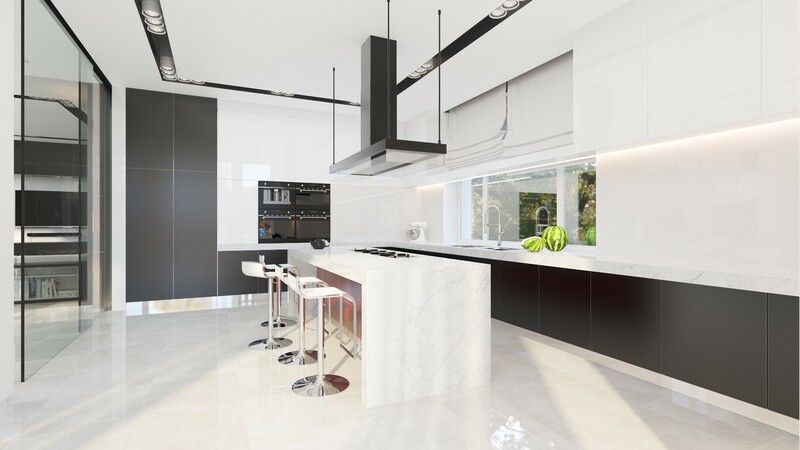 Not to mention, waterfall countertops made out of marble or other stone options can produce truly stunning looks due to how you have both horizontal and vertical applications of the stone. This will highlight the veining of the stone, which will impart more of an artistic quality and look to your kitchen island. While it’s most common to see waterfall countertops utilized as a kitchen island, which is an excellent way to create a powerful focal point in your kitchen, it’s not the only application for them. As you’ll see once we get to the price section below, going big with the full-on waterfall countertop island can be a pricey endeavor. Fortunately, if you want that clean look of the waterfall countertop without the massive expense, there’s a couple options. For one you can simply utilize it at the end of a cabinet run, creating the feel of a contained storage space that is nestled within whatever countertop material you decide to go with. The other, fairly common option is to build a peninsula or extending table with this design aesthetic as the element that creates a sense of harmony between your counters and the rest of your kitchen. In most cases, price determines a lot of outcomes for people. 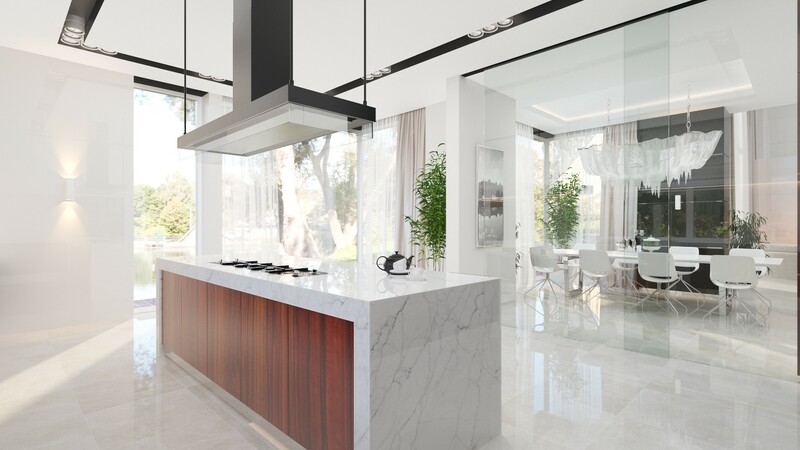 While waterfall countertops benefit visually from being cut out of marble, granite, or quartz, it isn’t the only choice, but it is the most durable and aesthetically pleasing choice. Additionally, as it relates to the contemporary or transitional rule, rustic or industrial design aesthetics can be complemented by a waterfall countertop if the material is wood or concrete or something more common to those design styles. 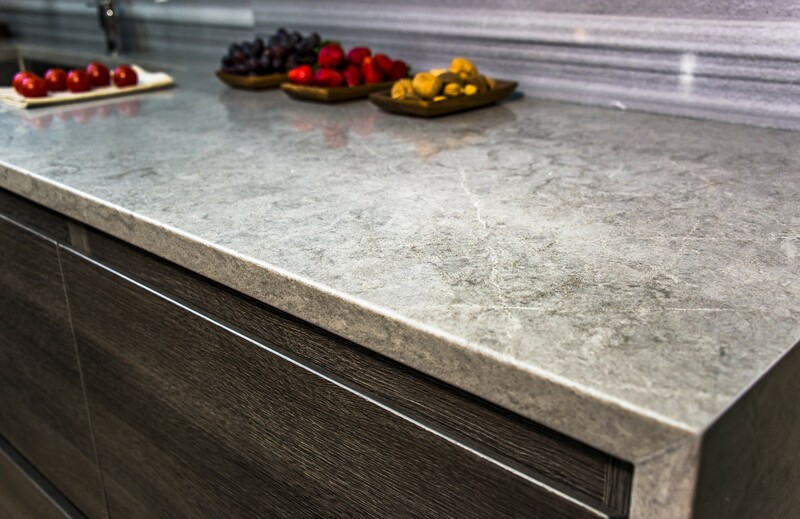 A concrete or wood version of the waterfall countertop is a cheaper option than marble or granite, however, as stated above, choice of material will dictate what style of design you need to employ as well as how long it will hold up to use. Not to mention, a proper waterfall countertop should technically be made of marble or granite as part of the reason for its name is due to the effect the stone’s veining creates down the vertical pieces. Roughly speaking, if you spring for the sharp elegance of marble or granite, you’re going to easily spend a few grand or more. Besides marble and granite being more expensive options in general, there is also the cost of labor and time that comes from hiring experienced professionals to build your waterfall countertop out of stone (even though waterfall countertops are rarely DIY projects). Not only do they have to come and measure your space, they have to install it for you as well, which will take place after they cut it down precisely, to the point that no seam should be visible once it’s in place. This is high level craftsmanship executed over an already costly material. Depending on budget, it might not be worth it, but this brings us to the final thing you should consider before committing to a waterfall countertop design. What all home renovation and design choices come down to is the pursuit of individual joy, happiness, and comfort. It’s your house after all, and the goal of sprucing it up is to improve your overall experience of being home. If you’re certain a marble or granite waterfall countertop is exactly the set piece that will make your kitchen a place of joy and comfort then it’s hard to let money get in the way of that. Of course, we all have real world responsibilities and bankrupting yourself for a nice looking kitchen seems silly. But at the same time, never treating yourself to something that would improve or upgrade your home life is a surefire way to live in a house that never truly feels like your own. So if you’re feeling the waterfall countertop concept, the best thing to do is go for it. Get creative, find a material that fits your personal aesthetic (and budget), and then craft the larger room design around it. In the end, you’ll be happy with the final result, and that’s ultimately what home improvement is all about.